Anonymous Shirdi Sai Devotee From India says: Om Sairam. I am a Sai daughter from Odisha, member Of Mahaparayan group MP-326 roll no. 9 no. It is my identity. Sai gives me what I do not deserve. 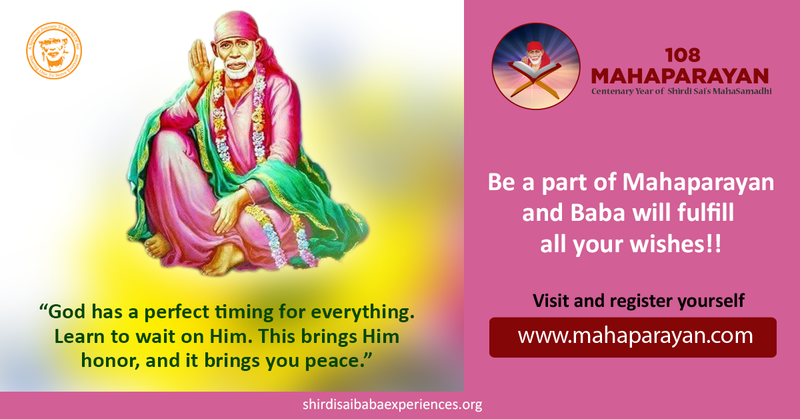 I have lot of financial problems but Sai helps manage it in His own ways. When I am thinking that Sai I have less money and all that then Sai starts His miracle. Shopkeeper, auto rickshaw driver never demand other than my thought and my friend circle also helps a lot each and every moment. I ask Sai please help me. I am selfish and doubting You because of struggle in my life. But Sai lovingly says, “I always love you and I am with you.” I pray for everyone that Sai like me bless all. My second experience is I have weakness toward someone very much. But I unable to say any one because Sai permitted this relation as good, and that is why I beg only to Sai. Baba I have chosen wrong or right path I do not know but Baba please be with me in every step of life. I am unable to say, stay with me, love me, talk to me because he has no worldly attachments. Every day I pray Sai that I can’t stay with me because he never stays for a long period at one place. But this man called me on Thursday and talked to me. I really felt blessed that day. Sai guide us, give a heart to both love and serve our society. I always think we are born to love God and society. Baba loves us and both of our family members. Please Baba never separate us. Sai give special love to my mom and all abnormal and refugee of this society. Om Sairam give me a heart to serve You well and love You. Guide me for right and wrong Sai Baba. Baba’s blessings are uncountable for a doubting girl like me. My mom’s life is full of pain but Sai’s blessings make her life full of happiness. Thank You Sai. I everyday pray Sai Baba to please give my mother little happiness and now I must say that my mother’s life is little happy due to His blessings. My two sisters are helping greatly to take care of her. It is a big gift for me Sai Baba. Another miracle was before last Thursday. Two days before, my lip’s upper side had swollen and it was unbearable day by day. Wednesday night before going to bed I said in my mind, “Sai I can’t bear the pain. I am putting the Udi on affected area. Baba, please show Your mercy on me.” Thursday morning when I woke up in the morning I found this area was normal in size. It had got cured without taking any single medicine. That day I had read one quote that, “When you doubt my existence I will come to clear your doubt.” You only love doing naamjaap. Every day I was doing some name chanting of Sai. Sai kept His promise by curing me and blessed me with His deep love towards me. Thank You Sai and stay with me every moment in this birth and every birth. Baba, change my negative thoughts to positive thoughts. Baba I want to come with my mom to Your place and Puri. Baba, thank You for guiding and making me good in everything day by day. Baba keep us in Your loving heart. Baba, always be with me in this journey of love. I am fearful and alone. Om Sairam. Sorry for the big post. Baba, bless all. I pray to Sai to give me a hand to serve You and a sweet heart to love You. In Sai Satcharitra Ch.40, Baba says, “To keep up my words I would sacrifice even my life!” Baba always stood by His words when He was in the body form and has been doing so even after 100 years of His taking Samadhi. Baba alone knows how we would fare without Him in this worldly ocean and so He the ever merciful, kind and loving is ever at a distance of just a true call to Him from His devotees. So let us not hesitate to make a call to Baba, where the handset is our heart with specifications of unlimited love, faith, devotion and sometimes a little patience too! Love You Deva loads. Jai Jai Ho Sai.